The San Francosco de Assisi church in Ouro Preto. The Estrada Real or Royal Road is a series of historic routes in Brazil, spanning the states of Minas Gerais, São Paulo and Rio de Janeiro. Built in the 17th/18th centuries by labourers enslaved by the Portuguese colonists, these roads (a total of 1,600km in length) were important to facilitate the transportation of gold, diamonds and other minerals in the hinterland of present-day Minas Gerais to the ports along the Atlantic coast such as Rio de Janeiro, and on to Portugal. The Minas gold rush, which brought much wealth to Portugal and helped to finance the Industrial Revolution in England, led to fluorishing towns along the roads, many of which saw the construction of ornate government buildings, mansions and elaborate baroque churches. These days, the Estrada Real is a unique way for visitors to appreciate the lush nature and rich historical and cultural legacy in this part of Brazil. The route starts in Diamantina (the centre of diamond mining in the 18th/19th centuries and a UNESCO World Heritage town), then splits into two roads: one continues to Paraty in São Paulo state and the other ends in Rio de Janeiro. We kicked off our road trip in Belo Horizonte, Brazil’s sixth largest city, and headed southeast towards our first stop: the historic town of Ouro Preto (map). The name literally translates as ‘Black Gold’, a reference to its mining past. In 1980, the town was designated a UNESCO World Heritage site due to its significance during the Minas Gold Rush but also because of its amazing baroque architecture. Praça Tiradentes (Tiradentes Square) in the historic centre of Ouro Preto. Situated on several hilltops and valleys, Ouro Preto, with its steep cobblestone streets lined by colourful houses, grand buildings and baroque churches, is a gorgeous sight! 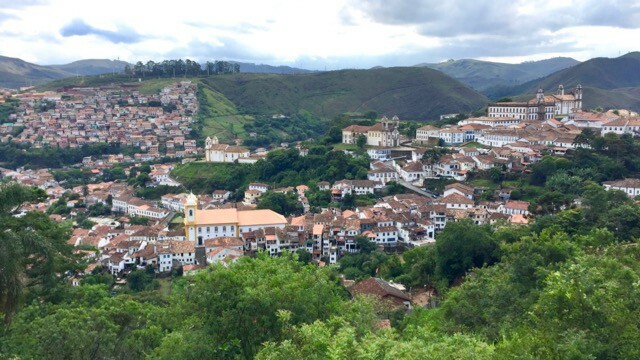 A panoramic view of Ouro Preto. At the height of its wealth in the 18th/19th centuries, Ouro Preto was the capital of Minas Gerais and attracted artists and scholars from around Brazil and Europe. These days, its rich colonial past can still be observed, particularly in its ornate churches. Decorated in gold and featuring sculptures by the famous artist Aleijadinho, these 18th/19th century churches are literally breathtaking. I couldn’t take photos inside the churches but believe me when I say that I have seldom seen such incredible baroque interiors, all draped in gold! Beautiful houses in Ouro Preto. An artist at work at the artisans market. A typical street in Ouro Preto. 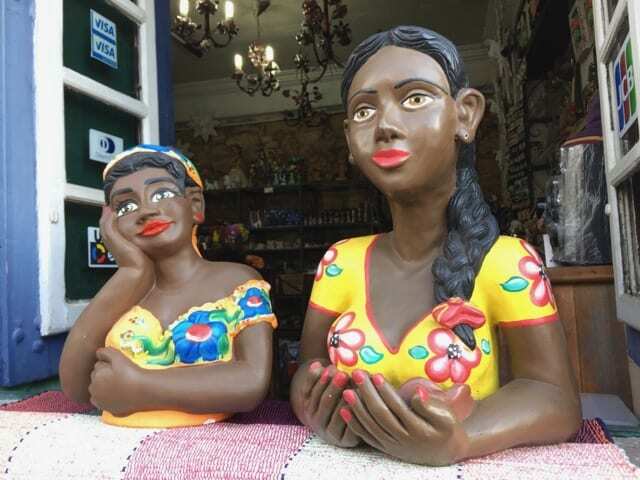 Namoradeira (the ‘Daydreamer’ or ‘Flirt’) are busts which can be found in many windows in towns in Minas Gerais. They sure add lots of colour to the street scenes in Ouro Preto. The imposing San Francisco church in Ouro Preto. We stayed at the charming Pousada do Mondego in the heart of Ouro Preto, directly opposite the artisans market. This hotel, with its colonial ambiance, colourful paintings and antiques, is an absolutely gorgeous place to stay at. The rooms are spacious and neat, and despite its old world character, the hotel offers free (high-speed) wifi and there’s free parking around the corner. My room at Pousada do Mondego. 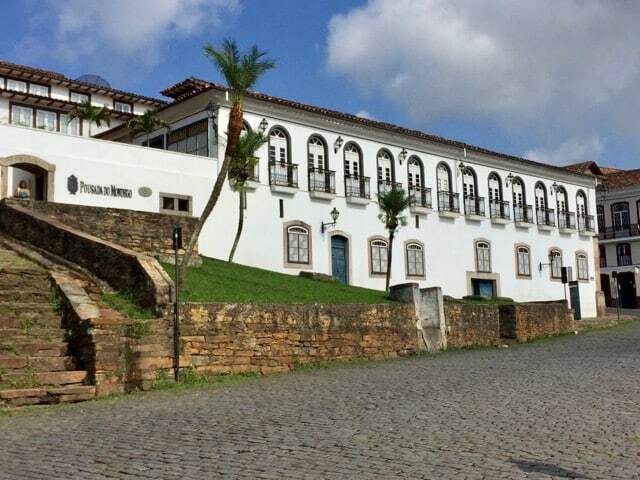 Check for rates at Pousada do Montego or search for hotels in Ouro Preto (via Booking.com). Ouro Preto is perfect for a stay of a few days as you’ll have time to explore its atmospheric centre, steep streets and awe-inspiring churches. For places to eat, I can recommend Bené da Flauta restaurant (next to the San Francis de Assisi church) and Contos de Réis restaurant. Both serve local specialties in cosy surroundings. 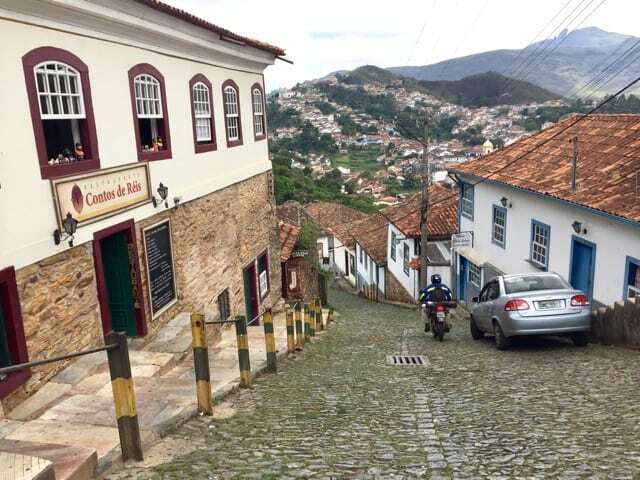 Restaurant Contos de Reis is located in a typical (steep) Ouro Preto street. Delicious chicken at Contos de Reis. The cosy interior of Bene da Flauta restaurant. From Ouro Preto, we drove the short distance to Mariana, the oldest city in the state of Minas Gerais. 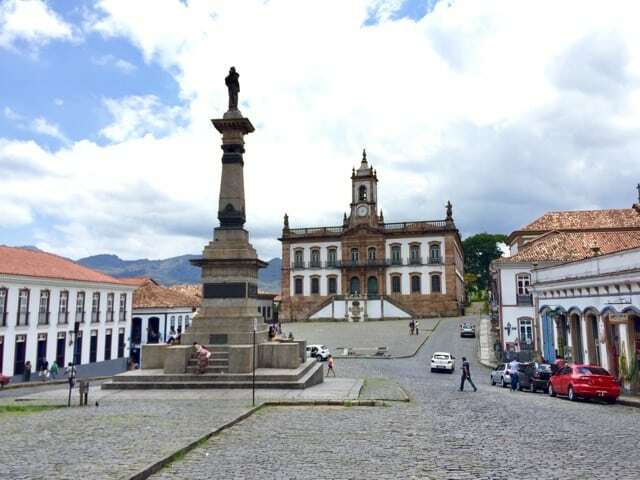 Like Ouro Preto, Mariana boasts a rich, gold-laden history and for a time, it was the capital of Minas Gerais, until Ouro Preto ran away with the honour. This 17th century town still very much retains its colonial feel, with beautiful historic buildings and churches. The stunning baroque churches in Mariana. We left Ouro Preto early in the morning and after making a big detour to visit the Inhotim Gardens (read about my visit to Inhotim) driving past verdant mountains and valleys, farmlands and little villages, we arrived in Congonhas (map), another of the historic towns along the Estrada Real. Pretty much like Ouro Preto, Congonhas is situated on several hills and valleys, and is famous for its baroque colonial architecture. The most iconic attraction of the town is undoubtedly the Basilica (Santuário do Bom Jesus do Matosinhos), a UNESCO World Heritage site, with its dramatic soapstone sculptures by Aleijadinho. The Basilica or Santuário do Bom Jesus do Matosinhos in Congonhas with its twelve soapstone statues by Aleijadinho. A close-up of one of the twelve statues. From Congonhas, we continued our drive to the town of Tiradentes (map), another picturesque town along the Estrada Real. This 18th century town was named after a Brazilian national hero who led an uprising against the Portuguese colonialists. A gorgeous street in Tiradentes. I loved the colourful façades in Tiradentes. I spotted another namoradeira in Tiradentes! The Sao Francisco de Paula church in Tiradentes. Another must-see church is the Santo Antonio church! Tiradentes, with its quaint cobblestone streets and houses with colourful façades, is a must-see along the Estrada Real. Its churches are, quite literally, gems with ornate golden frescoes, altars and statues, a testament to the region’s gold rush days. The town is nowadays a popular tourist attraction with lots of art galleries, cafés and restaurants. One thing I absolutely adored about Tiradentes are the colourful doors and windows of the houses! Collage of the colourful façades in Tiradentes. We stayed at the lovely Solar da Ponte pousada in the centre of town. The pousada has large rooms, free Wifi, parking, lush tropical gardens and a swimming pool. It’s also only a stone’s throw away from Tiradentes’ major sights. The charming lounge in the Pousada Solar da Ponte. Check for rates at Pousada Solar da Ponte or search for hotels in Tiradentes (via Booking.com). From Tiradentes, we continued on the last leg of our road trip to Rio de Janeiro. On the way, we stopped at Petrópolis (map). Nestled in the forested hills of the Serra dos Órgãos, Petrópolis is also known as the Imperial City as it was the Summer Residence of the last Brazilian Emperor (Emperor Pedro II) in the 19th century. The town is a great place to visit as it has various historic attractions such as the Summer Palace (now the Imperial Museum), the Cathedral, the Crystal Palace and many beautiful 19th century mansions, including the old residence of Santos Dumont (the great Brazilian aviation pioneer). The pleasant climate and tree-lined avenues make Petrópolis a lovely place to stroll around. The Imperial Summer Residence, now the Imperial Museum, in Petrópolis. The Crystal Palace in Petrópolis. Casa da Familia Sauwen: one of the many gorgeous mansions in Petrópolis. Another gorgeous house, the Casa de Antonio Picot. Search for hotels in Petrópolis (via Booking.com). From Petrópolis, we made our way through stunning mountainous landscapes before reaching the outskirts of Rio de Janeiro. I had a terrific time with Claudia and Mauricio on our Estrada Real road trip. Fabulous company, historic sights, quaint towns and many history lessons sure made this a memorable one! And I had lots of fun learning about and pronouncing the names of the places and important historical figures. If you love Brazil, gorgeous colonial towns, history and baroque architecture, add the Estrada Real to your bucket list! Read about my stay in Rio de Janeiro and the sights Claudia and Mauricio showed me. You can choose to start this road trip in either Rio de Janeiro or Belo Horizonte. Both have international airports. There are frequent flights from major cities in Brazil to Belo Horizonte. Various nationalities require a visa for Brazil. I recommend arranging a Brazil visa in advance. Note: a big thank you to Inhotim Park, Pousada do Montego and Pousada Solar da Ponte for hosting us during our road trip. As always, all opinions expressed above are mine only. This drive is definitely a great excuse to return! I can’t believe I missed this on my gap year. There is just so much to see in Brazil, it is easy to miss things I guess. Oh well, a great excuse to return. Thank you Isadora for your comment! Glad you enjoyed my post. I absolutely enjoyed the Estrada Real! Nice find. I lived in Belo Horizonte for 5 months and none of my Brazllian friends mentioned this…oops. Now I have yet another reason to return. Me neither until I was there! My Brazilian friends suggested it and it was a great surprise. I didn’t encounter many foreign tourists along the route. Interesting. I have never heard of this route before but damn – really beautiful. Seems like it wouldn’t be overly touristic either. I hope you get to drive this route one day. It sure was an amazing experience! This is one place I definitely plan on checking out when I make it to Brazil … thanks for the travel inspiration!